Post regarding the principles of the Nia White Belt. Nia White Belts focus on the body. The body is what we can use to teach. It is fascinating. By the time we teach a routine in front of a class we should know the music and the choreography so well we don’t have to think about it. I know I have shared before about how there is a point where I can’t learn any more without taking it to the class. That is not necessarily the way we were trained to do it, but that is how I do it. I have worked on learning a routine, got as far as I felt I could go, taken it to class and only done it for one class before I go back and work on learning it some more. With that one class I was able to get past the learning plateau. But for the most part we know the music and the routine well by the time we share it with our Nia students. This allows us to concentrate on what we are sensing. This is White Belt Principle #13, Teaching What You Sense. While Nia impacts every aspect of our lives, it is first and foremost a somatic practice rooted in physical sensation. Teaching what we sense, what we are experiencing in our own bodies allows us to connect with what is going on in our students’ bodies. When I feel the stretch in my side, I can say, “Everybody sense your side.” This allows each participant, each individual body to sense what is going on in his or her own body. It could be a stretch. It could be a twinge which might be a signal to tweak the movement. Whatever is sensed belongs to the individual. I am not saying, “You SHOULD feel . . ” I don’t know exactly what they should sense. Each person is different. Nia teachers invite Nia students to SENSE parts of the body so each person can get the workout their body needs. While we are dancing the moves we are showing the Nia students the Nia choreography, we are also guiding them with our words. In addition to guiding them through the Nia routine’s choreography we are guiding them through a somatic workout. A workout that is rooted in the Body’s Way. By teaching what my body is sensing participants learn what THEIR bodies are sensing and in turn we all learn our our own individual’s body’s way. Learning all of this in a cardio dance workout class might seem like a lot, but it is something that happens over time. It might also sound different than other exercise classes, and that is because it is different. It is unique. Each class brings new awareness. When students desire to they can take what we touch upon in class out into their lives. Being aware of the body’s sensation as we live and go about our everyday chores and pleasures. We could call it “Noticing what we sense.” But for me, as a Nia teacher/student I am encouraged to teach what I sense and it makes a world of difference in the workout you receive. Nia’s training, the Nia Intensives are something that anyone can take. If you are not planning on teaching you can still attend the intensives. Nia is a practice that can be applied to life without ever having to teach it. Nia has several different ways of helping with continued education both for the livelihood member and for teachers. First for a person that is planning on teaching, #12 of the White Belt principles is continued education. There are instructions and ideas on how to learn Nia routines. There are three stages to learning a routine. When I took my White Belt Carlos was very adamant about not skipping any of these steps. I am glad I have decided to post this because I am being reminded that there are a few steps in each stage that I could be better about doing. In the first stage we are reminded to just simply do the DVD. With each routine we have a DVD and we are instructed to just do it. Do it as if we are taking a Nia class. Do it as you would do any exercise DVD. Move, listen, and enjoy the workout. This is obviously one step that can be done several times. Another step is to listen to the music all the time. Listen and allow it to seep into the body. Then we are encouraged to FreeDance to the music. We are instructed to dance six of the eight stages. Keep in mind this can be over the course of days or weeks, whatever it takes. Then they advise us to just WATCH the DVD without working out to it. The last step in Stage 1 is to do the bars. Stage 2 is where we watch the DVD and note the separate portions of the body’s choreography. Three separate steps, first we watch and note the legs, then the core, then the arms. Stage 3 of learning a Nia Routine is where we start to go deeper into the routine by starting to have an awareness of the musical cues that signal a change in movement. By now, with having danced the routine to the Nia DVD as a student, listened to the music, mapped out the music, noted the choreography, and become aware of the sounds that tell us when there is a movement change coming we are ready to pretend. We call that teaching or dancing with your bears. It is the example used when you are at a point in the learning process where you are ready to do the workout and pretend there are students. During my Nia White Belt Intensive Carlos said something like set up stuff bears or spoons or pillows, just set up something so you can have a focus. I think the bear scenario is used in all intensives because we all call it “teaching/dancing with your bears”. Step 3 of stage 3 is to even go deeper into the music. It is amazing how the music will sound different after you have taught your bears. I might realize I need to pick a different music cue because while I am moving the one I originally chose gets lost, or I hear a better one. Sometimes I stop and don’t move at all to make sure I am hearing the music correctly. More advice includes being the student, doing the routine again, but as the student and not the teacher and getting more technical with the moves. Once you have the basic choreography down it is time to get technical and make certain you have all the levels of intensity familiarized in your body. The Nia Routine training DVD also has many other tools on it to help us learn the routine. They have a portion where they talk about the energy that goes with each move and more about the technical aspect of each move. One of the last steps is the recommendation to dance the routine with a different focus. That is a great way to learn a routine because it becomes practically brand new and you discover so much. The last stage encourages us to change the music. Because we have mapped out music and know the count of it we can pick songs that match and put the choreography to different music. In addition to these great stages and steps they have mapped out for us to assist us in learning a routine, Nia’s continue education includes articles and telecourses. They also film classes that they hold at Nia HQ so that people can watch and learn about more ideas that delve into Nia. In 2010 the course of study was the 13 Nia White Belt Principles. The course of study for 2011 is “Becoming A Sensation Scientist”, learning about senses of the body. I am not sure of what the course of study’s name is for 2012, but it looks as if it has to do with the body itself with title such as, “Awareness of Muscles” and “Awareness of Ligaments and Tendons.” So this is part of what I mean when I say Nia is so much more than a workout. YES, Nia is a cardio dance workout where you can go to a class and move your body to music get sweaty and get exercise for your body. But if you want, it can be a practice, where you learn more about your body. Even if you are not a teacher or a livelihood member Nia does a monthly telecourse call where everyBODY can listen, I would like to encourage you to check it out. Go to the main website for Nia and see all the education they have to offer. You might be just amazed as I always am. The 10th Principle of the Nia White Belt is X-Ray Anatomy. When I first heard this I thought, “What? Do the people that do Nia think they have X-Ray Vision?” But that is not the case at all. (Whew!) To put it in its simplest form it is a way to see the body. In Nia we study anatomy. We do not study it to the extent of doctors, but we read books and use tools to help us learn how the bones act as the frame and support of the body; how the bones protect organs, and how the bones connect. We examine the joints and how they move. Each type of joint: the hinged joints, the ball and sockets, etc. moves differently We notice how they move and how they allow movement. We also look at how the muscles move the bones, with contractions. In addition, we think about the connective tissue, believing that in order for it to be healthy it must move and be supple. Focusing on how the body was designed to move and appear allows us to “x-ray” beneath the skin using our intuition, our knowledge, and our eyes to possibly see areas that could use attention. For example shoulders in general should be level. Rounded shoulders could be weak muscles in the back not holding the back up and shoulders back, or tightness in the muscles in the front. Level hips is the original design, barring injury, hips off kilter could be a matter of weak leg muscles on one side. See how that can work? Looking at our bodies using our X-ray Anatomy can assist us in seeing and learning what our bodies need. Seeing what our bodies need give us the opportunity to give them what they need. When we have an idea of what our bodies need it enables us to practice Nia in the way that best suits our needs. Working out in a way that our bodies actually need makes working out enjoyable and makes you feel great. In Nia our sixth principle for the White Belt is the base. #6 The Base; Feet and legs. I sat down to write and as I was searching for something to post about it dawned on me that base came up yesterday and today. It is a different type of base yet a base is a base so there can be a connection, but in this post I am just going to share the things that came up and later write more on the Nia White Belt Principle #6 in another post. Yesterday I was out with a friend and we were eating something that she just found divine. She is one of those creative-in-the-kitchen-people and also trained in the kitchen. She was breaking down this item. She was tasting it and eating and trying to discover what it was. She came up with what she thought it was and then we both lit up when we realized that once she had that—the base, we could do whatever we want with it. We could make any flavor we want. It could become the condiment to end all condiments. It was awesome. Something you know but when you come across it and see how it can blossom into something or so many other things it is fun to be reminded that things start with a base. Today, I joined a small group of Nia White Belts to learn some music and work on a routine. There are not as many Nia teachers down in my part of the Bay, the South Bay as there are in the North Bay and the East Bay so whenever I get to meet with them I get very excited. We went through the steps that we were taught to go through when learning a routine. We did the first step in the process. Then after a couple of times of dancing the song it was clear we pretty much had the base down. The person leading the group started to say, “Or you could . . . .” “Have the class do this . . . . ” so there is was again . . . the base. In this case we had the base steps down and once we had that we are free to play a little more. We can play with speed, levels, or even changing the moves. I just think it is so interesting that I have had two very strong reminders of the importance of the base. It is important to have a strong base. It give your strength and security which will allow you room to grow. Cool. Fun. I love it. That was my day. How about you? Any “base” examples you can thing of? Anything else you want to share? Do you have any stories of a “base”? Maybe a weak base story to help support the idea of how important a strong one is? The first half of Nia White Belt Principle #7 is the Three Planes of Movement. The second half is Levels of Teaching. (You can learn more about Nia’s Belt Levels here) The three planes of movement in Nia can be easily described as low, medium, and high. The planes are used to allow our bodies to practice agility and mobility. We use the floor, the space in between, and the “high”. We bend and fold. We reach out and stretch up. We move in space both horizontally and vertically. With all the movements available to us in the three planes we have the opportunity to experience energy as it moves around us. In addition to the possibilities of energies the journey should be to pleasure and comfort. As you move through the planes part of practice of Nia is to observe how our joints open and move more freely. Just like the three levels of intensity Nia encourages everyBODY – regardless of fitness level – to work and play in all three planes. Keeping in mind everyone’s low, middle, and high is unique to their own body. Moving through the planes can tie into the levels of intensity. For example if doing the bow stance, the lower or deeper you go could be considered a level of 3 intensity because going down and coming back up would require greater effort and be more intense than staying “high” and not lowering into a deep bow. Strength, stability, and flexibility will also be a result of working through and in all the planes. The more we play in all of these areas we develop more ability in all of them, the more we can maintain balance in the entire body. If you want to join me in a Nia class please look at my San Jose Nia class schedule or my San Carlos Nia class schedule. I look forward to seeing you. A lot of workouts have different levels of doing. The second half* of Nia White Belt Principle #7 is (Intensity) Levels of Teaching. So to a participant of Nia that would be levels of doing. The different level in Nia are like most workout classes: level 1, level 2, and level 3. In a Nia class, participants are always invited to try all the levels, if comfortable. The idea is really to learn the value of each level. Trying the different levels allows the body to learn different things. Also the changes in movements stimulates the brain. Often times your energy level might dictate the actually level of intensity you are participating in during a particular class or kata, but that is up to you. No level is “better” than the other one, the best one is what is good for you and your body. You, as the person that lives in your body everyday, are the only one that can truly decide which level is right for you, which level at any given moment is going to bring you most Joy. As a Nia teacher, it is my job to show the participants three different levels. It is also my job to encourage you to try each level. It is important to remember that YOUR level 1 might not be the same as MY level 1, the same with levels 2 and 3. It is up to you, as a participant, to find your different levels and play with and play in all three. When you experience the different levels during your Nia workout you will learn to allow muscles that might be tired to rest and learn to stimulate other muscles. In addition playing with the different levels will enable you to experience Nia routines in a new light and a different way. So go. In your next Nia class or your first Nia class try all three different levels. Remember that everyBODY’s levels are different! *The first half of Nia White Belt Principle #7 is the Three Planes of Movement. Nia White Belt Principle #9 is Arms, Hands, and Fingers. Through the years it has changed the exact name. My White Belt Manual says “Upper Extremities: Arms, Hands, and Fingers”. When I was in the training we actually learned it as “Creative Arm and Hand Expressions”. Whatever it is called it is using your arms, hands, and fingers in your workout and in life. Ours arms, hands, and fingers can be used to hug, touch, caress, bringing comfort. They can be used to express ourselves to aid in communication. In the dance that is Nia, and in life they can be used to exercise our spirit with playfulness using our imagination to become wings, scarves, rain, water or whatever it is your arms, hands, and/or fingers sense. When we use them to punch and block or catch our bodies as we push off from the wall or the floor we build strength both in our arms, hands, fingers, back, and upper body muscles. The many circular motions incorporated into our routines help condition our muscles as well as our ligaments and tendons. Nia is not a linear cardio dance class. The idea is to move to promote health in the entire body. The hands have the capability to gather information and to move energy, to bring it in or send it out. We use our hands in Nia a lot. Not all movement classes include hands in the exercises. Nia understands the importance of hands and fingers. In addition to moving our limbs to promote flexibility and strength Nia weaves relaxation into the mix. It is understood that many people can hold tension in the upper body, in the shoulders and neck. We benefit from the opening and closing of the shoulder joints. We learn to recognize the different ways to move to promote relaxation. We can do all of this while we follow the moves of a routine or when we choose to activate the freedom that is encouraged in Nia. Either way, whatever you decide you will see how Nia does use the Upper Extremities: Arms, Hands, and Fingers a lot in Nia. I have been avoiding this principle because it can be very complex. To me, all of Nia’s White Belt Principles can be complex because they can be applied strictly to the cardio workout that is one aspect of Nia, they can be applied to Nia as a practice—which translates into, they can be applied to life, or they can just be applied to life. Debbie Rosas Stewart talked about Principle #5 in this month’s Nia Teleconference for EveryBODY. She kept it simple. In all the calls she talks for about 15 minutes then she takes questions for the last 15. The call is 30 minutes. I will share with you what she said, but I recommend you listen to the call when they have it up on the site. They record each call every month. Since I like to keep my posts relatively short, I have realized that I can post short summaries of Nia information and re-visit the information in additional posts. One of the first things she said is very true, and I would like you to think about it. She pointed out that we are often aware of pain whereas we are not aware of pleasure. If we have a sore body part, we are aware of it. It makes its presence known and we listen. I personally don’t think we always listen to what it needs, but that is topic of another post. But we certainly don’t always pay attention to pleasure. With Nia we seek pleasure. We seek to move away from the pain and go towards the pleasure. There are a few things we can do to assist with that. One way is to be aware. Be aware of what brings us pleasure. As we move throughout our day we can make our movements a dance. While we are “doing”, we can dance through life. As you are reading this and you shift in your chair, notice the movement of your hips, notice to tilt of your head, do it like a dance. While you are not moving, while you are “not doing”. Notice the stillness in your body. Allow the stillness to bring calm, relaxation, a sort of meditation, if you will. Notice what it is you are touching. Not just touching with your hands, but with your entire body. Are you sitting on a chair? Are you leaning on a desk? Benefit from that touch and that “not doing”. Life as art so notice the art around you. Notice the noises and allow them to filter in as sound. Breath in the sensation of life. Not talking about “art” that would be in a museum art, but just the beauty of the world. Whatever you find beautiful. There is so much about Nia I always find myself saying, “Another thing . . . one thing . . . Nia this . . . and Nia that. . .” but really. Another thing about Nia is that it is kind. Nia believes that we receive what we need to receive. We are not expected to hear something and walk away knowing it all or knowing it perfectly. With that in mind, understand that this is what I heard. These are the notes I took. Please, I invite you to listen for yourself and glean from it what you need. Focus on what resonates with you. Take away something you can share. My site shows Nia class schedule in San Jose and San Carlos. On Nia’s main site you can look up classes in your area. There are classes all over the world. Touching and Being Touched / May 3, 2010 Teleconference call is the call I have summarized here. Presently in your life, do you dance through it? Do you practice awareness? 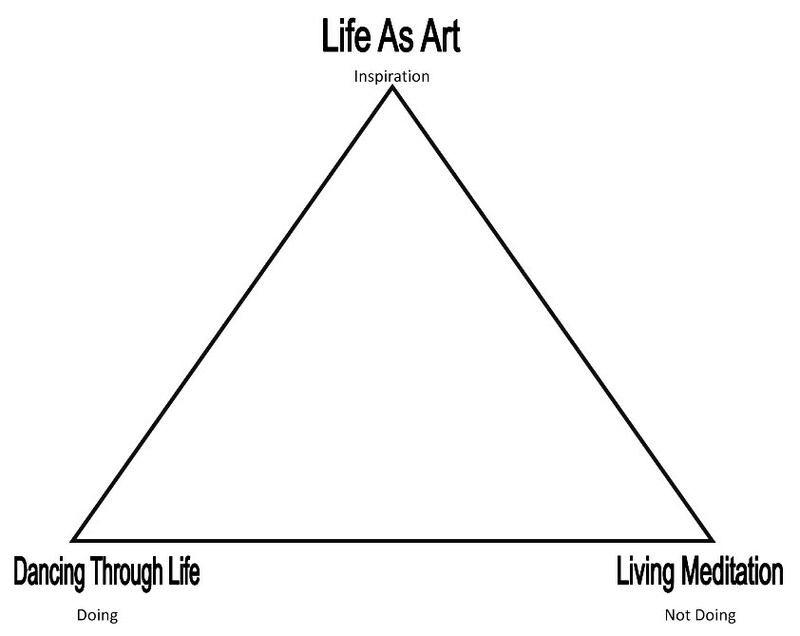 Do you notice life as art? Nia has been around for 26 years now, and I believe it is a company and a practice that will be around for a long time to come. Companies that survive they survive by changing, by growing and by adjusting. Nia is in a big adjustment phase right now. They have adjusted the Nia White Belt Principle #11 from “Business and Marketing” to “Creating A Sacred Livelihood”. This adjustment is to help principle number 11 be more in alignment with the body centeredness that is the core of the White Belt. But even though the name might sound a little different than other current courses of business that have surfaced recently, its not. It is pretty much in keeping with the trend that is right now. That is one thing I love about Nia. It really is not anything new, so it is not as if you are having to accept a handful of new ideas and “woo-woo” thinking, it is pretty much the same stuff that all “authentic” “live your truth” marketing people are preaching at this time. Ya know, have a philosophy and a purpose. Know that your purpose is alive so that is will be allowed to flex, change, and grow. In addition there is the “social purpose enterprise” aspect . . . believing that we are contributing to a higher purpose. Its the way Nia packages things is that help make it unique. With this adjustment to the principle we are taking “Business and Marketing” and making it more personal. The woman that came up with this, Karri Winn, spent over 4 years doing so. And from the video* made of the presentation it is evident. She is so comfortable talking about it and sharing it, you can tell she has lived with it for a while. She connected business to “me”, which assist with goes right back to the body centeredness, as I mentioned. Making it about “me” as in my life is an extension of my body is how it relates to the body-centeredness. Then using Nia to help us achieve our purpose. And with all of that together we will be able to create a livelihood. As I said in my last post, for me, Nia is a journey. Here is an article on the Nia Now site regarding Creating A Sacred Livelihood. Music and the 8BC System is Nia White Belt Principle #3. This is part 2 of the principle, a brief bit about the 8BC System. To learn our music, us Nia teachers, literally map out our music. We measure our music using a system of notations called bars. This is our map. We count out our music 1-and-2-and-3-and-4-and-5-and-6-and-7-and-8-and. Each bar has 16 counts. We count out the song noting the bars on a page. Then we go through and “dress” the bars adding marks to the page making notes of the sounds we hear. 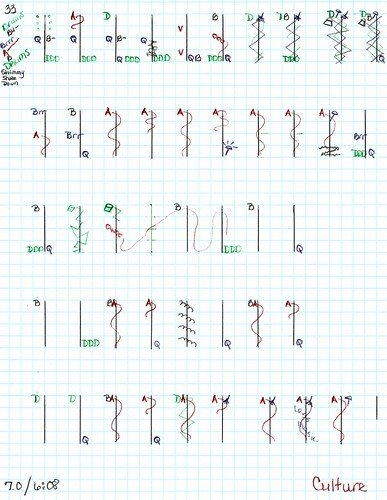 We use the noted sounds as cues for the choreography in a routine. No matter if the movements are matching the music or going opposite to it, the instruments and sounds are our cues. By mapping our music, (“barring” our music) we get to know our music really well. Knowing our music really well allows us to easily play with the choreography, while at the same time, sticking to the basics of it. We can also take the music that we have learned while learning a routine and add different choreography to it. Also practicing this barring system ensures that we can take any music and dance the Nia choreography to it. We just match the Nia music up with music that has the same count and we can pretty much just “plug” in the Nia choreography. All of this allows us to have fun while exercising and doing our Nia routines/Nia workouts. I have taken to the practice of mapping out my music and then scanning it so that I will have a completely mapped out song so when I am ready to add different choreography to it, I can just print my music map and put in the movement portion on my barred music. Mapping the music allows for so much creativity. Instead of just dancing to the beat you can dance to one instrument, you can allow your body to “BE” the cymbal or the flute, or you can shimmy to the melody, or sway to the harmony. It is fun to play with the music. And you can do whatever you want and lead your class through it all because you have a map! Since music is such a big part of Nia, I am sure that I will visit this topic often. I might even come back to the Nia White Belt Principle #3.